Posted by V the K at 1:08 pm - April 19, 2018. 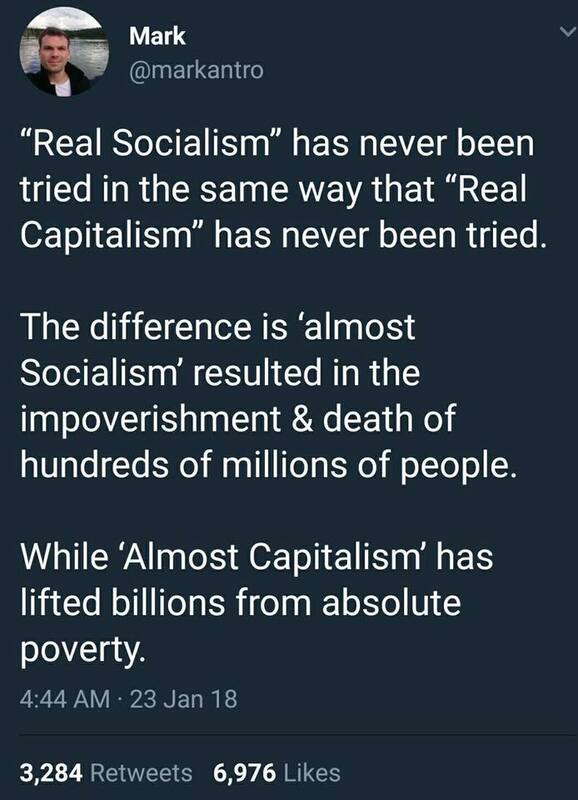 Probably the closest thing to “Real Capitalism” was what was practiced in Hong Kong between 1947 and 1997; a time when a tiny city-state became one of the most prosperous places in the world and had a tax code smaller than a TGI Friday’s menu. Chile also became much more prosperous after Pinochet dealt with the Communist there. He left office peacefully, leaving his country and free and prosperous. The same cannot be said of Castro, Chavez, Mao, Mugabe, or any other socialist maximum leader. Socialism, on the other hand, has led to more murder, deprivation, and poverty for more people than literally any other idea in history.